Families must register themselves. It is a bit of a process, you must create an account with East Cooper Baptist and proceed from there. https://ecbcchssc.infellowship.com/Forms/293017 Participation is optional. Nov 10: Deadline to register for Region Band. Auditions will be January 20th, and if selected, the region clinic is Feb 23-24. (For those invited to try out for all-state, auditions are Jan 27, clinic is March 16-18) All paperwork should be turned in by our October 31st rehearsal. Homeschool Families need to provide documentation of their home school accountability group membership - you can send a copy with your student to class or e-mail an electronic copy to the director. Other paperwork for you to fill out will be provided. For audition details, visit http://www.bandlink.org/allstate/auditions/ IF you are interested let me know. Nov 16-18: Limestone College Middle School Band Clinic in Gaffney. The clinic is free! It includes all meals and a t-shirt, but parents must provide transportation during the clinic and to and from Gaffney each day. The deadline for director recommendation is October 13. If you are interested please let me know. Not sure what the audition will be include (probably scales and sight reading). Nov. 30-Dec. 2: Newberry College High School Honor Band Clinic. The cost is $20.00. Meals in the college cafeteria are $30 for the weekend. Parents must provide transportation to and from Newberry each day. The deadline for director recommendation is September 15. If you are interested please let me know. Not sure what the audition will be include (probably scales and sight reading). December 12: Winter Concert at 7:00 PM. Call time will be at 5:30. Formal concert attire will be worn. Participation an absolute must! The information to the right provides updated meeting times and contact information for the 2017-2018 school year. This site will continue to be upgraded and improved! 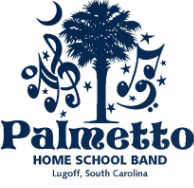 Feel free to contact the band at palmettohsband@gmail.com or just fill out a comment below.